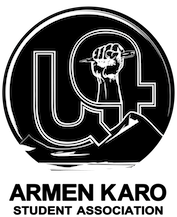 Armen Karo Student Association’s mission is to assist Armenian Student Associations at Canadian universities, to promote Armenian studies on university campuses, and to mobilise our communities in furthering the Armenian Cause through political, academic and intellectual means on a local, provincial and national level. In July 2005, students of Armenian origin in Canada abiding by the principles of respect for human rights, academic impartiality and a free, independent and united Armenia collectively founded a student association in order to streamline their work towards those ideals. The nom-de-guerre of national hero Karekin Pastermadjian was chosen in order to highlight a devotion to human rights, academic success and political engagement. Armen Karo’s life is seen as the optimal representation of the organisation’s membership and mission. Armen Karo is the nom-de-guerre of Armenian writer, philosopher, diplomat and soldier Karekin Pastermadjian. Pastermadjian was born in Karin (Erzerum), located in the eastern part of the Armenian Highland, in 1872. In 1891, he became among the first graduates of the Sanasarian Academy of Karin. He continued his studies in Europe, most notably in France where he was first introduced to the ideals of the Armenian Revolutionary Federation. Quickly becoming one of the organisation’s youngest and most promising members, he was elected as a delegate to the party’s second international convention in 1898. After completing his doctoral studies in physical chemistry at the University of Geneva in 1900, he returned to his native Karin. Pastermajian became instrumental during the Second Constitutional Era of the Ottoman Empire as a deputy to the Ottoman Parliament from Erzerum province. After this period and during the First World War, Armen Karo served as a volunteer in Armenian guerrilla units resisting the genocidal programme of the Ottoman authorities. He later became the first ambassador of the Democratic Republic of Armenian to the United States of America. Finally succumbing to a heart condition in 1923, Karekin Pastermadjian left behind a legacy which we are proud to continue in his name. Congratulations to Armen Karo Student Association of Canada for its pioneering work in developing an online database of master’s & doctoral dissertations on Armenian topics. I expect this database to become a most useful research source for both scholars and laymen with interests in the various subfields of Armenian Studies. This database is both a significant contribution to the further development of Armenian and Caucasian studies and a sign of the achievements so far of this ever emerging field. Here is a place to start, to learn what is out there, and where a scholar might make his or her own addition to our knowledge of this part of the world. On May 1, 2013, Canada’s ARF Armen Karo Student Association announced the launch of its Armenian Thesis Database, a new, online tool located at www.armeniantheses.com. The website is the result of a year-and-a-half of work and brings together master’s and doctoral dissertations written on Armenian topics from around the world. Armenian students encounter several challenges within their universities and their everyday environment, which they can not solve. Nonetheless, when some students do solve these challenges, they want to communicate with other Armenian students and share their thoughts and experiences. Our conventions analyze all challenges and find solutions to each, in order to come around these challenges together as one for the continuity of the Armenian heritage and culture. The Armenian Cause should be pursued and brought forward with the help of all Armenians, and each Armenian individual has the right and obligation to participate. Students have a lot of responsibilities within the ASAs, and as such, ideas are exchanged in order to overcome obstacles. © 2015 ArmenKaro.org. All rights reserved.